From the outside, you wouldn’t expect the humble Ford Fusion to contain technology that could upend the global transportation paradigm—until you notice the LIDAR unit whirring on its roof. LIDAR, which stands for Light Detection and Ranging, is a remote sensor technology that uses pulses of light to produce a 3D picture of the surrounding environment. It’s also the foundational technology powering Ford’s experimental autonomous car. As one of the journalists invited to take a spin in Ford’s autonomous Fusion at a demo day hosted last week by Mcity, the University of Michigan’s 32-acre autonomous vehicle test bed designed to replicate real-world traffic conditions, I can report that the ride was smooth and pretty uneventful. And that’s just the way most of us probably want our first self-driving car experience to be. As we slowly wound our way through Mcity’s streets, the car was able to “read” when traffic lights went from green to yellow, and then slow down accordingly. When the car came across U-M students pretending to be preoccupied pedestrians wandering into intersections, it gently came to a stop and let them cross the street, even when they purposely lagged or changed direction. Granted, the car’s human supervisors had scripted these scenarios, but at no time did the car go rogue or drive in an unsafe manner. And that, says Wayne Williams, a member of Ford’s autonomous vehicle research team, is probably the best possible outcome for a self-driving car demonstration. That hurdle, convincing the general public to hand their car keys over to a computerized chauffeur, may be bigger than the technological challenges that need to be solved before self-driving cars can hit the open road. 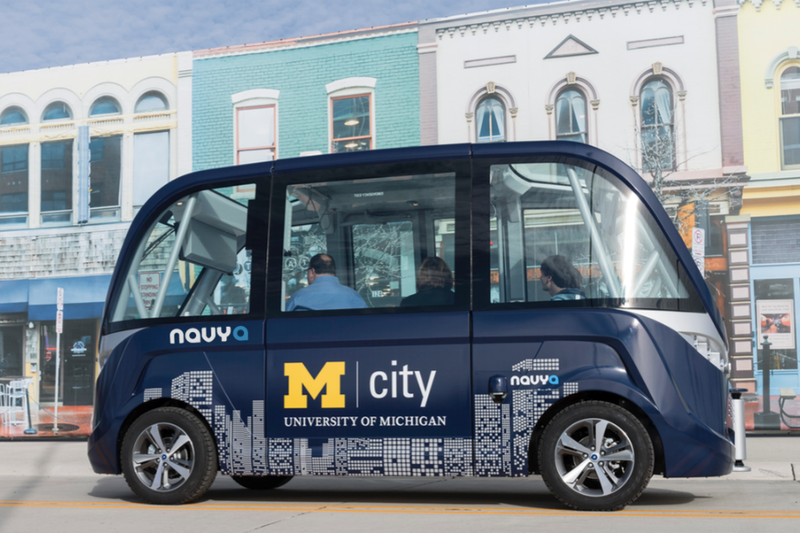 U-M has already collected early data about consumer acceptance of autonomous vehicles—more on that in a minute—and the information-collection process will ramp up once the university unleashes two 15-passenger, self-driving shuttles on campus in the fall. Manufactured by the French firm Navya, the ARMA shuttles are fully electric, equipped with cameras and WiFi for easier data collection, and rely on a combination of LIDAR and GPS technologies for navigation. Starting in September, the shuttles will transport students and faculty on a non-stop, two-mile loop between the Lurie Engineering Center and the North Campus Research Complex. The sleek, bullet-shaped shuttles, which look a little like overgrown smart cars, are a “critical research project that will help us understand … this type of mobility service and how people interact with it,” said Huei Peng, Mcity’s director, during remarks at the demo day event. Although the ARMA shuttles won’t be equipped with human drivers, there will be a safety officer on board who will be able to answer riders’ technical questions. External cameras will monitor the reactions and behavior of riders as well as other road users, including bicyclists and pedestrians. Mcity will also track ridership rates and usage patterns, and will survey passengers to gauge consumer acceptance. Carrie Morton, Mcity’s deputy director, says U-M will wholly own the shuttles for at least a year. (Navya paid for its Mcity membership by offering U-M use of the ARMA shuttle technology, she adds.) If the self-driving shuttles prove popular, the fleet could grow. Morton says as far as she knows, the shuttles are the first of their kind to operate on public roads in the United States.